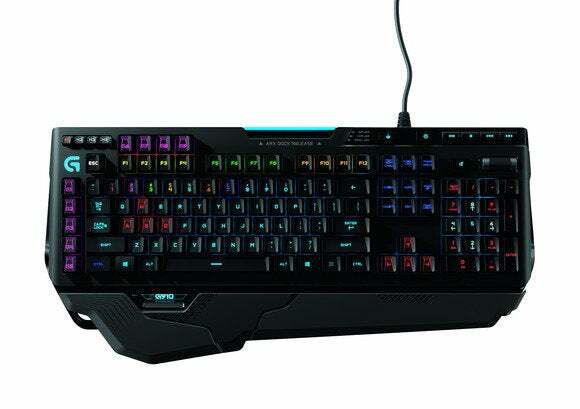 Logitech's G910 Orion Spark is a completely new keyboard with completely new switches, built from the ground up for gaming and full RGB backlighting. As such, it's probably the device where we have the most to talk about because, well, it's entirely unique. Let's start with the design of the keyboard itself, which is weird enough as it is. The G910 is a similar shape to previous keyboards in Logitech's lineup—that is to say, a bit chunky. Even with the smaller of the two wrist rests attached, this thing will take up quite a bit of your desk—thanks to a row of macro keys on the side, another row on the top (above the function row), the dedicated media keys, and a phone dock (more on that later). Logitech's new G910 features heavily scalloped keys that just weren't comfortable to type on. I'm not a huge fan of macro keys, but I do think it makes more sense to have five on the side and another four up top, since that's way easier to trigger than trying to distinguish between three rows of macro keys on the left side of the board. The media keys are standard Play/Stop/Back/Forward/Mute and then a volume wheel. 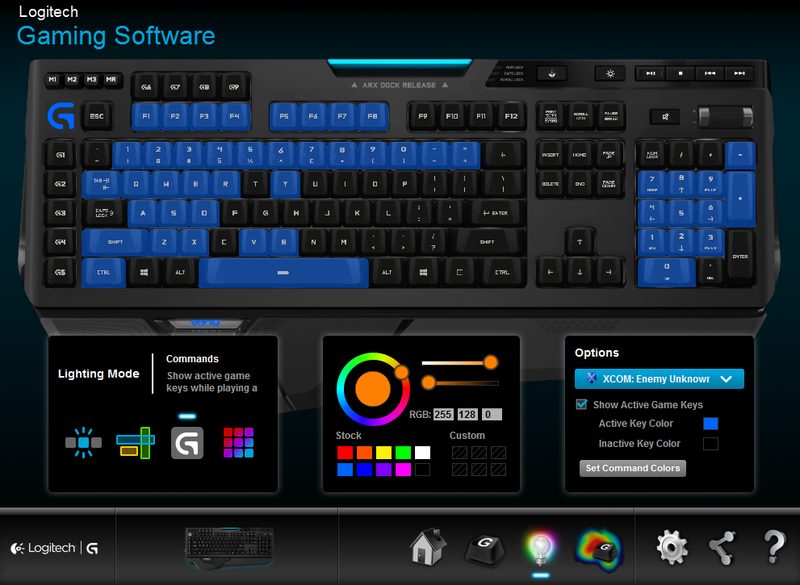 Logitech got weird though when it designed the keycaps on the G910. Most keys come in a pretty standard shape—a hollowed bowl, with the four corners slightly raised. The G910 uses a scalloped shape on all its keys. In other words the left, top, and right sides are angled upwards. It's like a little hat for your fingers. Furthermore, the scalloping is different on every single key. 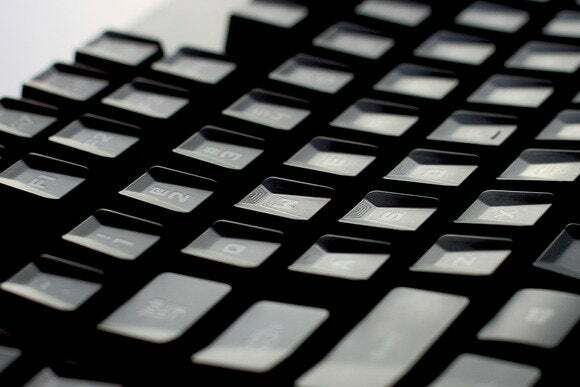 The WASD keys have the most distinctly raised edges, to help you find them quickly and accurately. The effect recedes the farther right you move on the keyboard. As such, the G910 is a uniquely weird device to type on. Uncomfortable, even. No matter how much I tried—and believe me, I tried—I couldn't get used to the feel of the keys. It's not too bad for things like shooters, where your fingers tend to stick on the WASD keys the whole time. For typing or for games with lots of hotkeys, though, I found my fingers commonly "caught" the edges of keys on their way by, or landed awkwardly on the key at an angle that caused significantly more distress than normal keys. And it's not helped by the Romer-G switches. Romer-Gs are Logitech's proprietary switches, designed (like Razer's Green and Orange switches) with games in mind. Unlike most of the new crop of mechanical switches though, I can't even think of a good Cherry comparison. If there were a gun to my head I guess I'd say MX Browns, but really the Romer-Gs are a class of their own. That's not to say they're good. I like that the Romer-Gs are quieter than your average mechanical keyboard, but they lack the satisfying oomph of a typical mechanical switch, feeling kind of mushy and dull instead. There is a distinct actuation point, but it's really close to the key's resting point. Combine the mushy feel and the high actuation point, and the G910 might as well be a rubber dome keyboard. I've talked to Logitech about it. I've asked them if they have other switches planned. They gave me a "Not right now" sort of answer, which is only frustrating because the lighting on the Orion Spark is so damn good. The G910 Orion Spark is hands down the best-looking of the three RGB-enabled keyboards here. 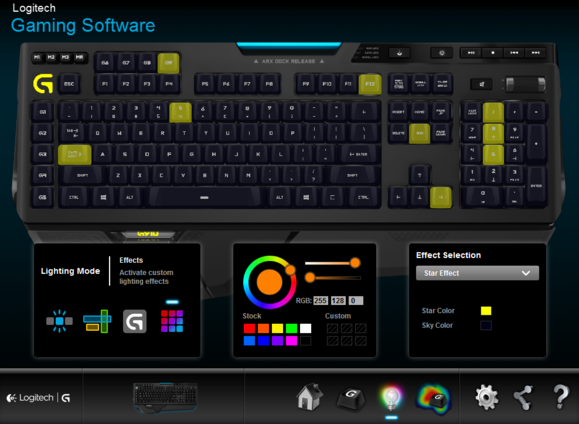 And it'd better be, considering Logitech built the Romer-G switch specifically to cater to RGB lighting. 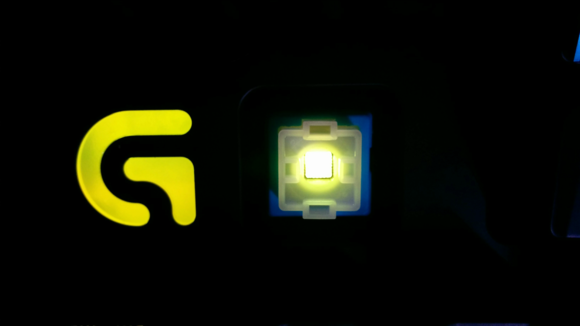 Rather than the typical Cherry MX stem design, pry off one of the G910's scalloped keycaps and you'll find a hollow indentation, with the lighting element dead center. What does that mean for the end product? Incredibly smooth lighting and color from top to bottom across entire keys, plus almost zero light leakage around the outside of keys (something that both Corsair and Razer's offerings suffer from). The only oddity: While the G910 logo at the bottom and the enormous "G" at the top of the keyboard are color-adjustable, for whatever reason the media keys and the macro profile keys (the four tiny ones in the very upper left) are not. The media keys stay blue, the macro profile keys stay orange. Logitech's software strikes a good middle ground between the ease and accessibility of Razer's Synapse 2.0 and Corsair's bag of nightmares. It's not a particularly pretty program, with icons that look like Word Art from the late 90s. However, once you've clicked on the icon that looks like a lightbulb doing mushrooms, you're presented with a fairly simple lighting interface that also has a surprising amount of depth to it. Logitech's software is split into four key lighting modes: Freestyle, Zones, Commands, and Effects. Freestyle, as you might expect, lets you change every key individually. You can also drag color across multiple keys. Zones allows you to group keys you use together often and then switch the color of each group—for instance, the Arrow Keys or WASD or the Function Keys. You can stick with Logitech's default zones or create your own. It's basically a quicker, more orderly version of freestyle. Effects give you some goofy but beautiful options, most of which it shares with Razer's presets: Breathing, Reactive (here called "Key Press"), Color Cycle, Wave, and the incredibly relaxing Star Effect (which simulates gold "constellations" on a navy blue background). And then there's Commands, which Logitech is still fleshing out on a case-by-case basis. Commands will detect which game you're playing and activate only the necessary keys. However, support is all down to Logitech's (or maybe the developers?) implementing key bindings for their games—for instance, Civilization: Beyond Earth still isn't supported nearly two months after its release. Finally, we should get back to that dock I mentioned way back at the beginning of the article. It's not a functional charging station or anything, but merely a place to stick your phone. Logitech has released its free Arx Control software for Android and iOS phones, which lets you pair your device with your computer, adjust profiles on the fly, use it as a secondary media control, and even monitor your PC stats while you're playing. It's pretty damn nifty, even allowing me (through the magic of technology) to launch games on my PC from my phone. That particular feature takes the prize for the absolute coolest and stupidest thing I've done with technology this month: I launched Diablo III. On my laptop. From my phone. I still think Logitech has room to grow. Various game-specific features mentioned prior to release still haven't made it into the product as sold currently, and wow I hope Logitech comes out with a switch I enjoy more than the Romer-G. But as far as lighting is concerned, the G910 is the winner. It's easy to configure, and thanks to the Romer-G's unique design it's also the best-looking of all three contestants. I've had this thing running the Star Effect setting for many days now, in between testing various game settings. As an added bonus, Logitech's Arx Control software adds a lot of weird functionality, provided you have a device that can take advantage of it.